Parisian women know that you can't go wrong with black. That's it. It's slimming, elegant, and an outfit can change in a jiffy from casual to more formal with accessories. Can it get much easier? (Well actually it can - you have to know what jewelry and what scarf to choose but that seems to come naturally to Parisians. I can tell you right now, a red wool plaid scarf just won't cut it). Today was shopping day for me to buy a few fall items. (I know I know - I ranted about tossing things but before I throw out my old rags I had to buy something to wear)! I bought black. And, just to be a bit radical, a grey sweater. The only thing that worries me about the all black business is that people might think I'm wearing the same outfit every day. I have several pairs of black pants, several black skirts, black jeans.....but really, who cares? The fact is, you can't have too much black! 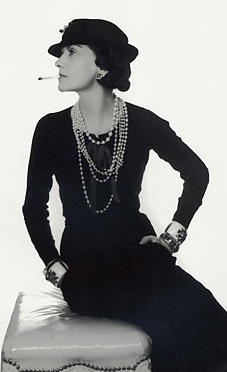 Chanel in her little black dress was absolutely right. Let's keep it simple. Gawd! I hope white never becomes the new Black!